GPS Locator: 3518 W Memorial Rd. 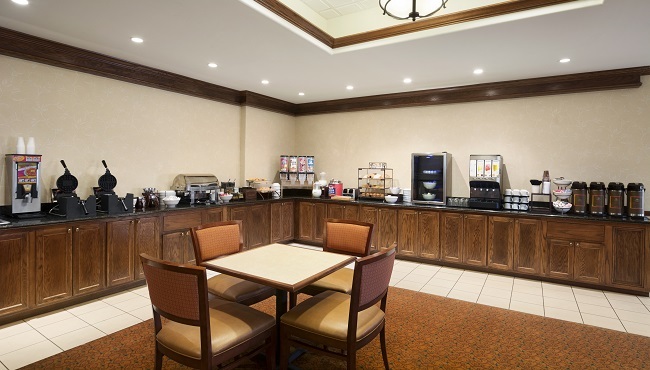 The Country Inn & Suites, Oklahoma City - Quail Springs gives you a strong start to your day with the free, hot breakfast. Pile on the sausage and eggs while your waffle cooks to golden perfection, or go for something lighter like cereal and yogurt. When it’s time for lunch or dinner, you’ll have plenty of nearby restaurants to choose from, such as Nunu’s Medterranean Cafe and P.F. Chang’s. For a unique dining experience, head to the restaurants at Bricktown, Oklahoma City’s premier entertainment district.